What a year, ey? First contact with aliens, world peace, a cure for the common cold! Talk about a turbulent 12 months! Oh, right… reality. Well, there's certainly been plenty to remember on the video gaming front. We've seen Sony and Microsoft both beginning to find their feet on the eighth gen of consoles, Ubisoft patching their patches with patched patches and developers everywhere running in terror from their stated release dates. Crikey. If only there was some way to take stock of all that we've experienced in the year that was 2014? 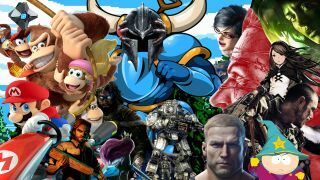 Well, now you can, with the big bumper edition of GamesRadar's historic, old-timey, much loved, definitely-not-just-started-three-weeks-ago weekly quiz. Hold on to your collective butts, it's the GR+ quiz of the year!